The Bio-Innovate Program Management Team (PMT) had a three-day extensive visit of Bio-Innovate consortia project run by Makerere University Kampala (MAK) on 12-15 July 2012. The itinerary included officiating the opening of a refurbished controlled environment growth chamber renovated by project consortium 1 on ‘delivering new sorghum and finger millet innovations for food security and improving livelihoods in eastern Africa’; visiting a private company working with consortium 2 on ‘enhancing food security through improved seed systems of appropriate Varieties of cassava, potato, and sweet potato resilient to climate change in eastern Africa’; and a pilot project site under project consortium 5 on ‘integrated process for sustainable agro-process waste treatment and climate change mitigation in eastern Africa’. 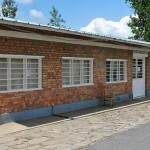 Building on previous investments made by Bio-Innovate’s predecessor, BIO-EARN (Eastern Africa Regional Programme and Research Network for Biotechnology, Biosafety and Biotechnology Policy Development), project consortium 1 renovated the controlled plant growth chambers using Bio-Innovate Program funds. The consortium will now have at its disposal a better facility to conduct research and deliver on their project components. Present during the ceremony were Samuel Kyamanywa the principal investigator of project consortium 2, Patrick Okori a co-principal investigator consortium 1 and officials from the College of Agricultural and Environmental Sciences (CAES) at MAK. Other guests were from the National Crops Resources Research Institute (NACRRI), an implementing partner in project consortium 2, and the National Agricultural Research Organisation (NARO). 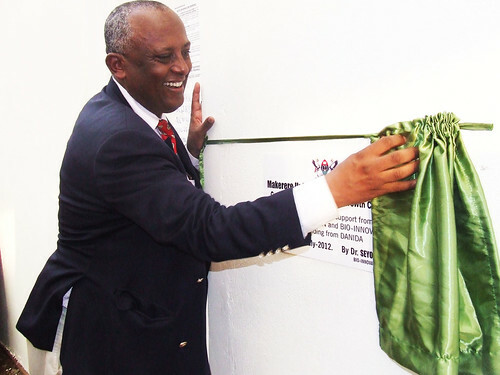 Seyoum Leta officially opens the renovated controlled plant growth chambers (photo credit: Bio-Innovate-ILRI/Albert Mwangi). In his speech, Seyoum Leta the Bio-Innovate Program Manager acknowledged the significant contribution and commitment of MAK to the Program. “Makerere University is participating in four out of the nine consortia projects,” Seyoum said. In one of these consortia projects as the lead implementing institutions and in the other three as co-lead implementing institutions.” With that level of commitment, a lot is expected from MAK and Seyoum was pleased with the progress made in implementing their project activities. While addressing the gathering, Patrick Okori who spearheaded the renovation of the laboratory indicated that, in line with Bio-Innovate’s innovation philosophy, the team had used locally available materials to accomplish the refurbishment. He pointed out that the growth room would support scientists to accurately replicate controlled conditions in their experiments. 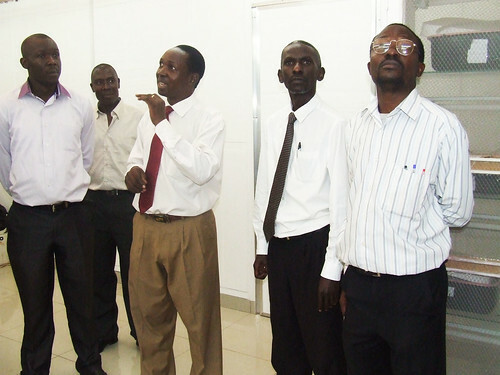 Invited guests tour the renovated controlled plant growth chambers (photo credit: Bio-Innovate-ILRI/Albert Mwangi). The consortium 1 research team was elated with this new development. Mayada Bashir Mamoun, a PhD student whose research focus is on ‘sorghum breeding for multiple disease resistance’ disclosed to the PMT of her earlier frustrations in creating replicable conducive conditions for the growth of pathogens used in testing multiple disease tolerance of germplasm. She lamented that the manual process previously used had been “time-consuming and exhausting” as it required her to often work long hours, and sometimes through the night to sustain optimal temperatures at the laboratory. “With the rehabilitated facilities, it will be easy to automate the pathogens growth processes with minimal or no disruption to her other project activities” Mayada said. Setumba Mukasa, a co-principal investigator in project consortium 2,took the PMT to visit Biocrops Uganda, a private company in Wakiso District, 20kms away from Kampala. The goal of the consortium is to evaluate and deploy improved varieties of cassava, potato, and sweet potato that are adapted to climate change in diverse agro-ecologies, and developing and institutionalizing efficient seed multiplication and delivery system in eastern Africa. As an implementing partner in this consortium, Biocrops is multiplying sweet potato and other planting materials obtained from MUARIK. HarvestPlus, an international non-profit organization that strives to reduce hidden hunger for billions of people through bio-fortification, then buys these planting materials to distribute to local farmers. 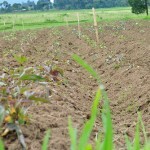 The sweet potato planting material from MUARIK has been enriched with Vitamin A and is disease and pest free. Bio-Innovate’s strategy of involving the private sector as implementing partners in it’s consortia projects for sustainability beyond project life is captured by this partnership between Makerere University and HarvestPlus. The potential impact of such a joint venture is enormous as it creates a value system that is sustainable way beyond the life of the project. Project consortium 5 on ‘integrated process for sustainable agro-process waste treatment and climate change mitigation in eastern Africa’ is working on biogas production as a byproduct of recycling wastewater from the City abattoir’s operations in Kampala. Joseph Kyambadde a co-principal investigator in this consortium gave the PMT a tour of the recycling plant. 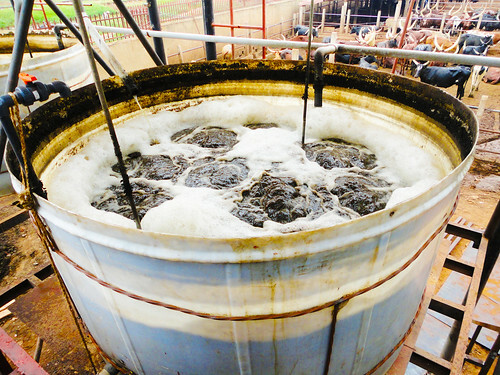 The wastewater from the slaughterhouse contains high concentration of organic matter including suspended solids, nitrogen, and phosphorus that are harmful to the environment if not disposed off properly. Joseph envisages the facility will produce 60,000 litres of methane in 1-2 weeks, which according to his estimates, is equivalent to 28,000 litres of diesel fuel. Joseph will use the methane to power a generator that he modified to run on gas. Due to limited space at the abattoir, Joseph innovative idea was to have the standard anaerobic ponds replaced by huge plastic tanks held in place by a metal structure for stability. The wastewater is then pumped up into the tanks to start the process. After passing through the anaerobic tanks where most of the harmful waste materials are removed, Joseph’s team has created a marshland right behind the facility to remove the nitrogen left in the wastewater. The recycled water is then released into the normal drainage system and although not suitable for human consumption, is harmless to the environment. Pilot abattoir wastewater treatment site in Kampala (photo credit: Bio-Innovate-ILRI/Albert Mwangi). The Program management noted that the level of dedication to deliver innovative solutions. Seyoum lauded MAK for its contribution to Bio-Innovate’s projects but noted that the technical progress reports should be detailed enough to accurately reflect the efforts partners were putting in implementing their project activities.